You innovate…We help create and facilitate! We harness the latest trends and technologies to complete software development as quick as you need it! We have successfully developed a variety of platforms and programs for industry leaders in Telecommunications, Healthcare, Technology, Insurance and Manufacturing for many years. We have mastered every methodology and can pivot based on the scope and needs of your specific development projects. We have also used key technologies such as Microservices, Containerizing, and low code to excel at our customer needs for digitization, ecommerce, web services and creating bots. Identifying and evolving with changes in consumer behavior and staying ahead of Market Trends. Keeping our “pace-to-market” unrivaled with regard to timely and effective software development. Excelling in not only, the development of software and platforms to solve your immediate needs, but we also prepare solutions to withstand future shifts by integrating the software into the core of your customer experience. Many times, the “off the shelf” solution is too limiting or fails to align with your company’s strategic vision. Custom application development can help enhance existing applications or develop completely new ones that enable your business to function at the speed of the global economy while still maintaining a focus on cost-effectiveness, overall quality, and service delivery. 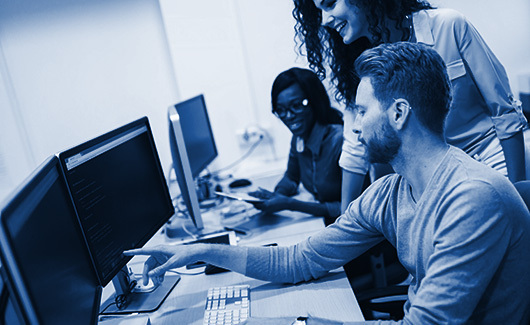 GRMI offers a wide range of services for end-to-end custom application development as well as building that one specialized area that your business may not have expertise or bandwidth to handle. All our solutions are robust, scalable as well as extensible, and adhere to the latest industry standards or whatever your specifications and needs may be. Many businesses are faced with a majority of their intellectual property or business value locked up in a legacy application that is difficult to replace. GRMI is committed to helping our clients preserve this critical intellectual property and business value while offering a cost-effective way to modernize these legacy applications. We have proven strategies and experience modernizing legacy applications across many business areas including providing triage services and life-support for those applications that are just too mission critical to fail your business. Sometimes a legacy application is just too old or reliant on outdated hardware that it becomes a real risk to your ongoing business viability and competitiveness should it fail or have a hiccup. In these cases, a complete tear-down and rewrite of the application may be necessary using the latest technologies and methodologies. GRMI specializes in these kinds of engagements and in working with your subject matter experts to get it right the first time, delivered on time, and delivered within budget. GRMI has a wide range of experience building and maintaining mobile applications on both the iOS and Android platforms. We have the knowledge from hard-won experience to build your mobile application using the latest tools and technologies as well as leveraging various cross platform compatible coding technologies to reduce cost and increase the speed to market. GRMI can be a valuable application lifecycle management partner. With budgets continuing to decrease or businesses seeking to get more return on their investments, GRMI can be your experienced I.T. partner. We can help you with cybersecurity, deployment and delivery, data migration, and ongoing infrastructure maintenance as well as our full range of architecture, design, development, and quality assurance services.